A VR Cycling Experience for $40 – Yanman! A strip of paper is taped to the tire. Each time the wheel makes a complete rotation, the Arduino will detect when the piece of paper passes by and then sends a wireless message to the mobile phone. In software, a virtual bike is created to travel in a virtual environment. The virtual bike will only nudge forward whenever the app receives a message from the Arduino reporting that the physical bike’s wheel has made a complete rotation. We are effectively mapping the physical action of pedaling to movement in the virtual space to make an oversized gaming controller. The virtual environment is constructed in Unity. To render for virtual reality, I’m using Google Cardboard – a free software SDK for mobile VR. The SDK for Unity is drop dead simple – just drag and drop a prefab into your scene and you’ll instantly have a stereo camera rig to manipulate. This was a fun little personal project and I’ve learned what I set out to learn, so this is where I move on – but if you’re going to try something similar, here’s some things I’d consider in retrospect: It wouldn’t be too much of a stretch to have the physical bike steer the direction of the virtual bike. Why not give the player total freedom to explore? Also, does the virtual bike have to be a bike? I’ll just leave this right here: http://goo.gl/fRWY6Z. For the interested Makers out there, below is a schematic of the IR sensor along with the Arduino code. Tinker away! 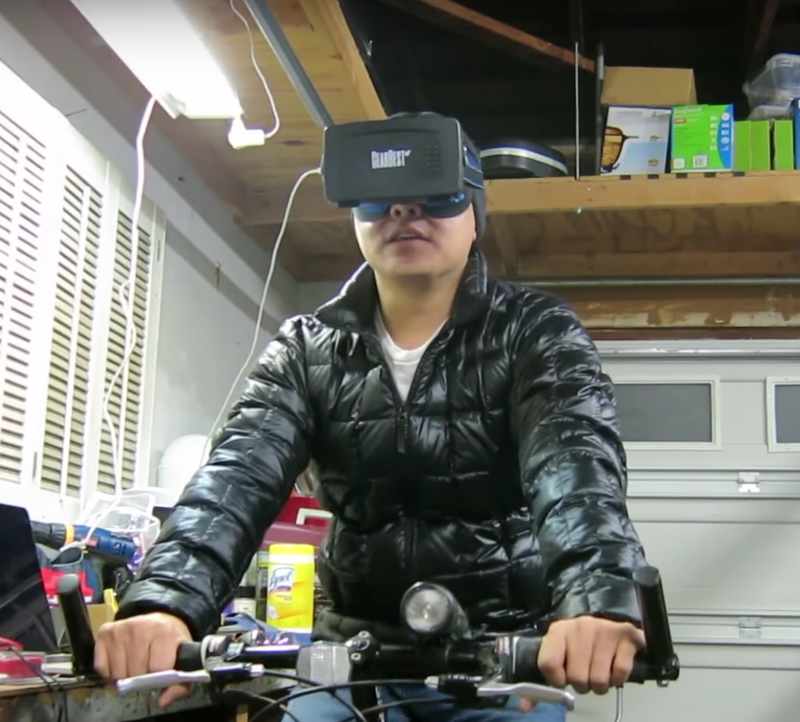 Pingback: Build Your Own VR Cycling Experience for $40 #ArduinoD16 « Adafruit Industries – Makers, hackers, artists, designers and engineers! Awesome work, could you share the unity project or at least scripts? Cool project. I made a similar experience, but with a more barbaric approach. I am building your Arduino thing, but I have no Android programming experience. Would you be willing to share your apk? Heres a link to Check out my Instructable. Hi Aaron. Arduino and Android are two different platforms. There is no apk involved in this project. What platform are you using for the VR headset? I assume you used an Android device in the Google Cardboard, if so what app are you using? I think you built a custom app, if so would you share your app? hi i have absolutely no knowledge in this area. can you layout a part list for this arduino and then how to program it. Love your VR Cycling setup. Did you find yourself feeling motion sick after a while? What should i do man????? Looks like you didn’t include the libraries into your Arduino client. We are hoping to include the picture of yours (https://pauldyan.files.wordpress.com/2016/01/vrbikethumb.png?w=1200) in this book (Chapter 10, Figure 10.8b ). Could we please have your permission for this? Thank you. Yes, under condition that there’s a link back to the original blog. Thanks! Thanks! If I know the radius of the wheel I can already infer speed/distance. 5. led for indicate arduino works. Any thing i forgot b4 i run wild with that? Paul can you please assist? Don’t forget you’ll need a bike, a stand, a phone, VR goggles, a computer to program the Arduino, soldering equipment. I am constantly finding out I need something new along the way. I don’t think I’ve ever gotten my full list of parts ready up front ever. Just start and you’ll quickly realize what you’ll need along the way. Paul I’ve tried to build the arduino part, and didnt understand something. Why do we need the OUTPUT irPin (pin 7)? Sholdn’t the Ir sensor only send data to the arduino? Pin 7 is to power/control the IR LED. You need to shine the light to bounce off something before receiving it with the sensor. which already have the nob i think, i’ve changed your code a bit. to only indicate if the sensor is respond or not. ITS NOT WORKING :(. I’m not familiar with that component but it doesn’t look like the same sensor to me. I think this is just the sensor. You need to have an LED firing IR light so it can bounce off your reflective material to be received by the sensor. The app is not published or available. Do you have a link to such an asset ?? I think you’ve only published part of the development and not everything complete. I do not think you’re generous, quite the contrary. I would prefer not to have found this project since I lost time investigating it and finally I discovered that you have published to us how the connection between the app and Arduino is made. You have not shared the app either. I’m working in a project that I need to communicate hall sensor from Arduino to unity like yours. Could u help me with a code? Could u share a code with me?!? I really need to finish my work! Currently I have a code but when I stop to pedal my bike keeps running. If you’re already able to get the bike to move forward based on input from your sensor, you’re very close! In my implementation, each time I detected a rotation from the sensor, the Arduino sends a BLE message to the Unity app. When that BLE message is received, the Unity app applies a force to the bike – this is *not* the same thing as setting its velocity. Think of a force as a single PUSH forward, it will naturally decelerate over time if it doesn’t get additional pushes. So, if the input no longer detects rotations, it will no longer send messages and if no additional messages are received, the bike will naturally slow to a stop. 2. I have attached a motor to provide resistance and support to the rear wheel for the inclination and declination in the video. How could this be done? I have the complete data of the altitude of every point.